A while ago, I wrote about how the E46 325i is the best first car for the budding petrolhead. For the most part, I still stand by my statement; it really is a fantastic one that does it all car. However, its heart has one big, potentially fatal (for your motor and wallet) flaw. While BMW makes fantastic motors, the M52/M54’s oil pump design isn’t designed for the abuse of the track. Let me explain the problem and the solution. Even though inline sixes are in perfect balance mechanically, there are still hundreds of things moving every second, and vibrations still exist. To counter these vibrations BMW saw fit to equip a harmonic damper to the front of the M52 and M54, integrated into the drive belt pulley at the crankshaft. The BMW M5x oil pump is driven by the motor by a chain, as you can see in the featured image. That chain drives the sprocket that’s connected to a shaft which drives the pump’s turbines; a single nut that’s reverse threaded holds the whole assembly together. At sustained very high (6,000 RPM and up) RPMs, the extreme harmonics caused by the high speeds cause that single nut to back off, or undo itself, disconnecting the sprocket from the shaft and leading to a total loss in oil pressure for the head, causing extensive engine damage. 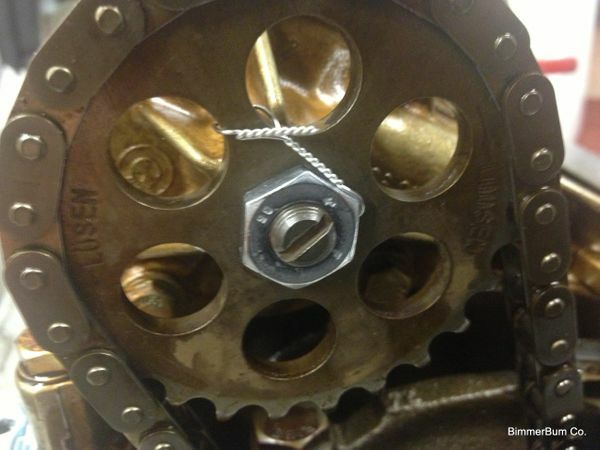 Some people, such as the person who provided the image at the top, think that tying the nut with wire/adding Loctite/welding it to the sprocket is enough to solve the problem. All it does in reality though is make the sprocket and nut one unit, which then transfers the stresses over to the next weakest link; the pump’s shaft itself. The shaft isn’t designed for the extreme stresses placed on it, and shears right off the pump’s rotor, leading to a catastrophic loss in oil pressure. It’s important to note that while this flaw mainly affects the M54B30/S52 due to their shared crank and poor harmonics, all members of the M5x family are affected. It’s also important to note that this flaw does not affect street cars, whom rarely will reach the high sustained RPMs needed for this issue to crop up. So, if you don’t plan on ever going to a track with your car (you really, really should by the way) then you have nothing to worry about. The fix depends on what you’re trying to do. If all you’re doing like me is street/spirited/some track driving, the best fix is to get an upgraded sprocket and shaft. There are three companies offering this upgrade, lowest in price first: Achilles Motorsports, VAC Motorsports, and Bimmerworld. All companies sell you an upgraded shaft that you have to press in yourself along with a new locking nut; they will also sell you new pumps with the upgrade already installed, letting you just swap the pump out and send the old one back as a core. The way to access the oil pump is to drop the sump at the bottom of the motor; that means dropping the front subframe and supporting the motor from above. Not a hard task, but a time consuming one that may take a weekend. While you’re at it, you should replace the OEM harmonic damper since they have rubber in them and rubber breaks down with heat and age. Image Credited to ATI Racing. 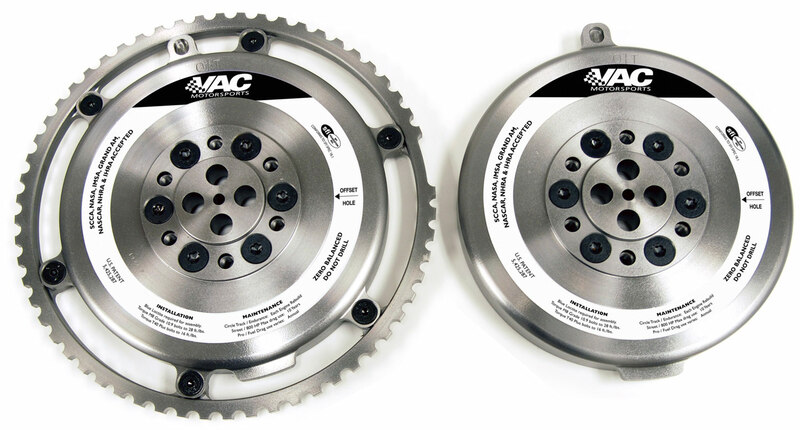 If you’re building an all out track car that will see sustained very high RPM usage, or if you’ve chipped your car to get a higher rev limiter, your best bet will be the ATI upgraded harmonics damper; that said, I have extreme doubts anyone reading this will need such an extreme measure. So, should you be worried about the oil pump nut problem? Honestly, with the upgraded shaft, I’d say no unless you’re doing some extreme mods/heavy tracking. For the rest of us who use our E46s as the one car that does it all, you’ll be fine.